“Honor of a lifetime to meet His Holiness Pope Francis. I leave the Vatican more determined than ever to pursue PEACE in our world,” Trump wrote, generating over 97,000 likes. He also changed his Twitter banner to feature a photograph of himself sitting across from Bergoglio during the 30-minute meeting. “We can use peace,” Trump replied. The Roman Catholic leader also gave the president copies of three of his essays, including his 192-page encyclical “Laudato Si’: On Care for Our Common Home,” which elaborates his climate change concerns. According to CNN, Bergoglio also “blessed a rosary,” which he gave to First Lady Melania Trump, who wore a black veil to the occasion. As previously reported, in February 2016, Trump expressed offense when Bergoglio suggested that he was not a Christian because of his desire to build a border wall to keep out illegal immigrants. 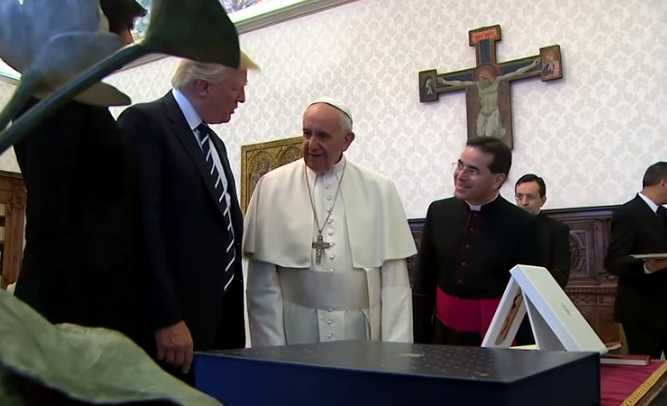 When asked if he would influence Roman Catholics during the election, Bergoglio stated that he did not wish “to get into that,” but repeated his statement with the notation that he wished to give Trump the benefit of the doubt. “I’m proud to be a Christian, and as president I will not allow Christianity to be consistently attacked and weakened, unlike what is happening now with our current president,” Trump added.